One reason for the World War was the mechanism of the alliance pacts between the great powers. After a nationalist, supporting the idea of Great Serbia, had assassinated the heir apparent of Austria-Hungary (the shots of Sarajevo), the twin monarchy issued Serbia an ultimatum and then declared war on the 28th of July, 1914. Consequently, according to the mechanism of the alliance pacts, Germany declared war against Russia, France and Belgium, Great Britain against Germany, Austria-Hungary against Russia and France and Great Britain against Austria-Hungary. This procedure created the "Central Powers" led by Germany and Austria-Hungary and around them the "Entente Powers" led by France, Russia and England. It became evident that the power of arms and the operational skills of the parties involved, sufficed to prevent rapid solutions. The German offensive to Paris stopped on the River Marne in early September 1914, and the Russian attack on Berlin through East-Prussia, weakly defended by the Germans, halted in the battle of Tannenberg in late August. 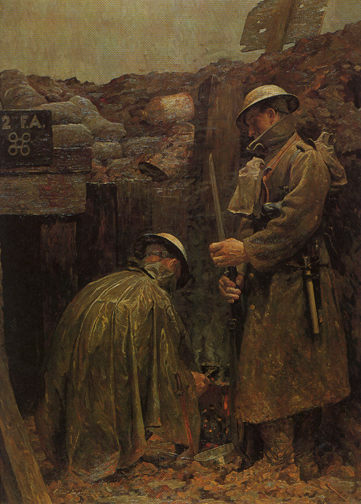 The war then settled down to the attrition of trench warfare on the fronts. The battles of Verdun in the spring and summer of 1916 and the battle of Aisne-Marne in the summer of 1918 were major battles on the western front. On the eastern front, big battles were fought in the area of Lublin in 1914, around Lake Masuria in the north and on the Carpathian Mountains further south in 1915, on the frontiers of Austria-Hungary (Brusilov operation) in 1916 and in Galicia in 1917. With the protraction of the war, new weapons were developed, which, so it was hoped, would settle the outcome. 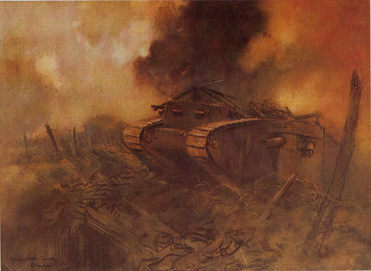 In 1915 war gases were brought to the battlefields, and in 1916 tanks. En extensive warfare started in the air. The enormous war fleets of the great powers were not so anxious to engage in decisive battles, but a trade war was raging on all seas of the world. In February 1917, Germany declared unlimited submarime war, which was one of the main reasons why the United States, having long remained neutral, declared war against Germany. The war expanded. Japan joined the Entente Powers in 1914, Italy in 1915, Portugal and Rumania in 1916 and The United States and Greece in 1917. Turkey joined the Central Powers in 1914 and Bulgaria in 1915. The troops of the Central Powers occupied Rumania in the autumn of 1916 and the battles moved to the eastern parts of Rumania. As regards Russia, the enormous financial and military losses caused serious dissatisfaction with the government and the direction of the war.The internal crisis resulted in the fall of the Tsars Empire in the so-called February Revolution in early March, 1917. Russia stayed within the Entente Powers. The Socialist bloc led by Bolsheviks promised peace to the people, and having assumed governmental powers in Russia in the so-called October Revolution, the Armistice was concluded on the eastern front in late November 1917. The Bolsheviks, under the leadership of Lenin, hoped that the idea of peace would give rise to rebellion and revolution, first in the German army, and after that in the other armies as well. The Bolsheviks were willing to grant autonomy to the minorities within the Russian Empire, in order to persuade them to abandon their anti-Russian attitudes, to carry out an internal revolution and to join in the union of sosialistic states. This is the reason why the Finnish declaration of independence was recognised, but the internal revolution met with no success in Finland, as Russia was forced to withdraw her troops from Finland under German pressure. A world revolution would have spared Russia an unfavourable peace treaty with the Central Powers, which was the reason why the Bolshevik Government delayed signing it. But Germany did not long tolerate dawdling. In February 1918, the German troops attacked in the east occupying Baltia and Ukraine, and Russia was forced to sign the peace treaty with the Central Powers in Brest-Litovsk on the 3rd of March, 1918. A civil war broke out in Russia at the beginning of 1918, as the anti-bolshevists attempted to suppress the Bolshevik government with the help from the western powers and occasional help from Germany as well. In Germany and Austria-Hungary rebellions arose only after the Central Powers had suffered military defeat. Bulgaria, Turkey and Austria concluded Armistice in late September and early November and Germany on the 11th of November. 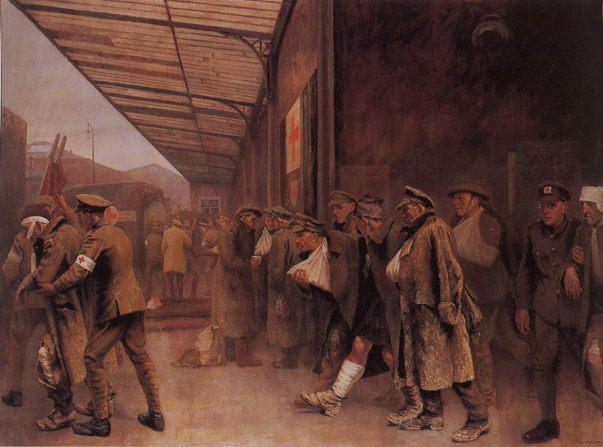 Approximately 60-65 million men had fought on the battlefields of the First World War. Less than half of them returned from the front uninjured. Around nine million men had lost their lives, seven million disappeared or taken prisoner, and about 21 million were wounded. Battles raging in large areas had caused unparalleled damage, destroyed buildings and sunk hundreds of vessels. For the twin monarchy of Austria-Hungary, the pressure of the world war was intolerable. The demands for independence among its separate nations became stronger and louder. After the Armistice in November 1918, Austria and Hungary declared themselves republics and the union of Serbs, Croats and Slovenes (later Yugoslavia) a monarchy. The Czechs and Slovaks had declared independence a few weeks earlier. The independent states of Finland, Estonia, Latvia, Lithuania and Poland rose out of the ruins of the Russian Empire together with some short-lived states such as Ukraine and Georgia.